So i cut a piece out of the base to let my larger gb fit. DIdnt think this would happen. Tonight I will be putting some rail up along with a ratchet strap to fix it up. Yeah, im using the cutoff from the first IBC, then i got a second IBC to cut a larger growbed from. Had to trim off a bit to make it fit. Will use the offcut as part of the fix. Had to buy a ratchet tiedown today, will apply tonight and put up pix. You need to attach a steel frame around it- 25mm RHS around the top plus a few verticals in corners and middle of the sides should hold it properly. What's with the absolutely ginormous photo? I cant post any more than 800X600 pixels. Smaller photo would be good then we can ubderstand the thread, but what did you expect with what appears to be NO support for the bed. Cant seem to edit the original post now. Didnt expect much. 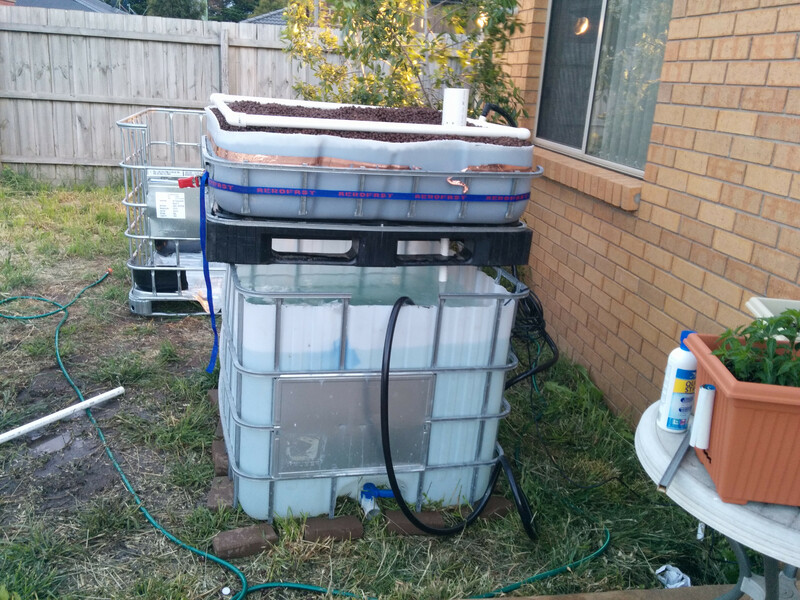 Im a total newbie, both to aquaponics and using tools. About the least handy person you could ever meet. Photos to a max 800 x 600 start thinking, every litre of gravel is going to be around 1 kilo and the same for water. Every system you would have looked at shows support around FT GB Sumps. sort of fixed for the moment. Will get a second strap which should permanently fix it. Now to redo the plumbing pipes correctly, and its done. Did a test run last night, all flowing nicely. For some reason the img bbcode wont let me resize images. I tend to just dump directly from phone to imgur, so actually editing the image size is a bit of a pain. Hence just posting a link. You should leave the cage around the bed. I think we all had doh moments. If you haven't disposed of that bit of cage, maybe you could slip it back over?